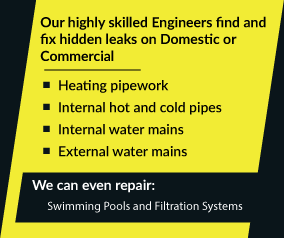 Is A Water Leak On Your Property Wasting Far More Money And Water Than You Could Ever Imagine? In our time working as a national leak detection and repair provider ADI Leak Detection has been employed by a wide variety of customers in Devon and every other county in England. The one thing that is consistent with our customers is the loss, damage and trauma caused by serious underground water leaks. 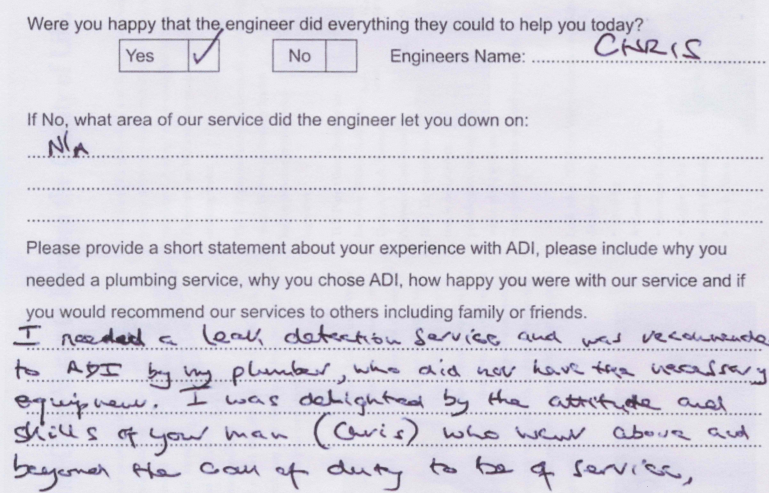 Expert help from ADI is just a single phone call away so you can stop worrying about that leak and just relax instead, our teams have the experience, the training and the leak detection and repair solutions to take care of any problem you might have. Plus there’s the added bonus that each member of our team is highly trained and completely insured to work on your property. 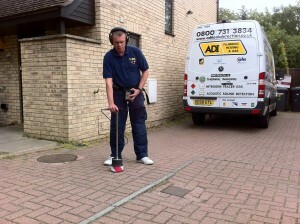 We use a wide range of non-destructive leak detection equipment to locate exactly where your leak is – this just means that we don’t need to dig or drill any holes to find the source of the leak, we only actually uncover the soil or concrete above the leak once we’ve traced it to within 50mm of its source. The presence of hot and cold areas inside your walls, ceilings, windows frames or floors can indicate an issue with a water leak. Using this type of technology means that we don’t need to guess where the leaks are. For those leaks that are truly underground our acoustic leak detectors can track them to within 2-inches of their source and up to 9-feet underground. Using a specially mixed gas and some electronic gas “sniffers” we can use our tracer gas system to reveal even the most sneaky of leaks. If you have multiple leaks on the same pipe or you have to work with leaks that could be located anywhere over a wide area then our leak correlation equipment can help track them down. 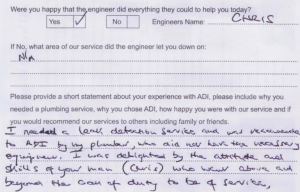 ADI Leak Detection are driven to providing each of our customers with the very best in leak detection and leak repair – saving you a lot of money and headaches in the process. After completing his work at my home yesterday, at the unearthly hour of 19:30 – some ten hours after his arrival – Chris asked me to complete and return the attached questionnaire. I have to say that the standards of service, attitude and behaviour, not to mention the required skill sets, were well above the levels that one has come to expect these days and I would have no hesitation in recommending him and your company to anybody seeking similar assistance. I hope that you can decipher my handwriting OK!